Having beautiful skin is one way to boost a woman’s confidence. That is why many women will go out of their way to find different skin care products that can eliminate dry skin and fine lines. Good thing there is Radha Beauty Rosehip Oil, which is among the best moisturizers available today. This product is 100% pure cold-pressed and certified organic. The manufacturer only uses the highest quality rosehip oil with no fillers. There are no added ingredients, for rosehip seed oil is proven to be good for the face and skin. It is so pure that you will notice the natural dark color and grassy smell every time you apply it. Although it is oil, it won’t leave your face oily. Revitalize your skin with this 4-ounce face oil. It can be used for reducing fine lines, wrinkles, scars, stretch marks, rashes, burns, acne scars, age spots, and more. If you have serious skin problems like eczema, dry and damaged hair, psoriasis, and hyperpigmentation, this can also effectively work for you. For consumer’s protection, the manufacturer even has a money back guarantee. You may contact them for any problems and they will return your money. This product also includes a free step-by-step guide on how to properly apply it. Radha Beauty Rosehip Oil. With a 4.3/5-star satisfaction rating on Amazon, this product is one of the best face oils today. Find out what people like about it as you read about the following advantages below. The best thing about this face oil is that it can treat a variety of skin problems from your face, hair, down to other parts of your body. Do you have dry and damaged hair or brittle nails? Do you have wrinkles and acne scars that are way too visible? Are you suffering from a serious skin condition such as psoriasis, eczema, or hyperpigmentation? Whatever issues you may have, this all-natural rosehip seed oil is sure to treat them and make you feel better. Though this is oil, the product is sure to leave your skin soft and not greasy. With this, there is no need to buy a number of different skin care items for treating specific problems, saving you money. According to the manufacturer, this product is 100% cold-pressed and certified organic. This means there are no fillers or added chemicals. There is no risk in using it. In fact, the manufacturer ensures a money back guarantee to all who buy this product. Even though this product has received a lot of positive feedback, it does not mean that it is for everyone. Some buyers broke out, saying that their acne marks didn’t get treated after several weeks of using it. Others think that it is only good as a moisturizer and not for healing serious skin conditions. While it is clear that the product is rosehip oil, others still question its authenticity. According to some, rosehip oil is light yellow and not dark. The manufacturer then explains that the darker color of the rosehip oil simply means that it is pure. And because it is darker, it tends to leave orange flakes or marks after application, which is something not good to look at. 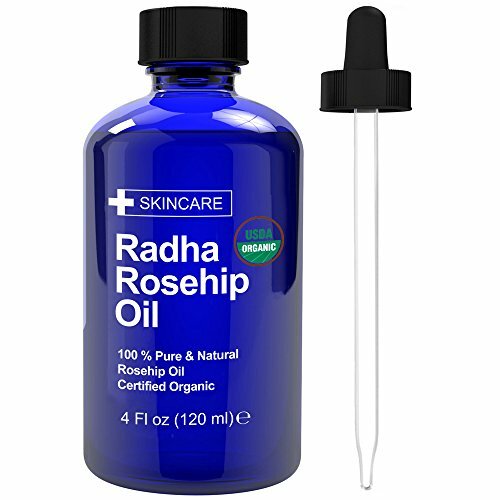 Radha Beauty Rosehip Oil is a great skin moisturizer. Though there is some negative feedback about it, there is no doubt that it is still one of the best on the market today. It is like a total package since it deals with a variety of skin issues. It is even advisable for those who have dry and damaged hair. This product definitely saves money. And with their money back guarantee, rest assured that there is no risk in buying it.